If this card in your possession is destroyed by your opponent's card (by battle or card effect) and sent to your Graveyard: Shuffle this card into the Deck. You can Tribute this card; Special Summon 1 "Madolche" monster from your Deck, but shuffle it into the Deck during the End Phase of your next turn. You can only use this effect of "Madolche Anjelly" once per turn. That Special Summoned monster cannot be destroyed by battle. If this card in your possession is destroyed by your opponent's card (by battle or card effect) and sent to your Graveyard: Shuffle this card into your Deck. Once per turn: You can target 1 Attack Position "Madolche" monster you control and 1 face-up Attack Position monster your opponent controls; if both monsters are still on the field, change them to face-up Defense Position, and if you do, the ones changed by this effect cannot have their battle positions changed until the end of your opponent's next turn. When this card you control is destroyed by your opponent's card (either by battle or by card effect) and sent to your Graveyard: Shuffle this card into your Deck. When this card is Normal Summoned: You can add 1 Field Spell Card from your Deck to your hand. There must be another face-up "Madolche" monster on the field to activate and to resolve this effect. When this card is activated: Shuffle all "Madolche" monsters in your Graveyard into the Deck. All "Madolche" monsters on the field gain 500 ATK and DEF. If a monster(s) in your Graveyard would be returned to the Deck by the effect of a "Madolche" monster, you can add it to your hand instead. When this card in your possession is destroyed by your opponent's card (either by battle or by card effect) and sent to your Graveyard: Shuffle this card into the Deck. Once per turn, when the battle position of a "Madolche" monster(s) you control is changed (and is now face-up), while this card is face-up on the field (except during the Damage Step): You can target 1 monster on the field; change it to face-up Defense Position, and if you do, unless it is a "Madolche" monster, it cannot attack, also its effects are negated. When this card you control is destroyed by your opponent's card (either by battle or by card effect) and sent to your Graveyard: Shuffle this card into your Deck. Your opponent cannot target face-up "Madolche" monsters you control for attacks, except "Madolche Chouxvalier". When this card in your possession is destroyed by your opponent's card (either by battle or by effect) and sent to your Graveyard: Shuffle this card into the Deck. Once per turn: You can target 1 face-up "Madolche" card you control, except this card; return it to the hand, and if you do, increase this card's Level by 1 and ATK by 300. When this card in your possession is destroyed by your opponent's card (either by battle or by card effect) and sent to your Graveyard: Shuffle this card into the Deck. You can target 1 monster in your Graveyard; banish it, and if you do, Special Summon 1 "Madolche" monster from your Deck, except "Madolche Hootcake". You can only use this effect of "Madolche Hootcake" once per turn. Target 1 "Madolche" monster in your Graveyard; shuffle that target into your Deck, and if you do, all "Madolche" monsters you currently control gain 800 ATK and DEF, then you can shuffle 1 other monster from your Graveyard into the Deck. When this card you control is destroyed by your opponent's card (either by battle or by card effect) and sent to your Graveyard: Shuffle this card into your Deck. When this card is Normal or Flip Summoned: You can add 1 "Madolche" monster from your Deck to your hand. When this card in your possession is destroyed by your opponent's card (either by battle or by effect) and sent to your Graveyard: Shuffle this card into the Deck. When this card is flipped face-up: You can target 1 "Madolche" Spell/Trap Card in your Graveyard; add that target to your hand. When this card in your possession is destroyed by your opponent's card (either by battle or by card effect) and sent to your Graveyard: Shuffle this card into the Deck. 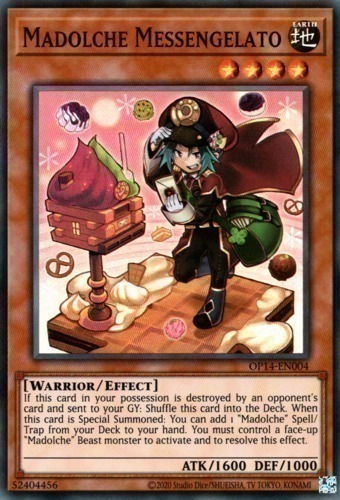 When this card is Special Summoned: You can add 1 "Madolche" Spell/Trap Card from your Deck to your hand. You must control a face-up Beast-Type "Madolche" monster to activate and to resolve this effect. When this card you control is destroyed by your opponent's card (either by battle or by card effect) and sent to your Graveyard: Shuffle this card into your Deck. 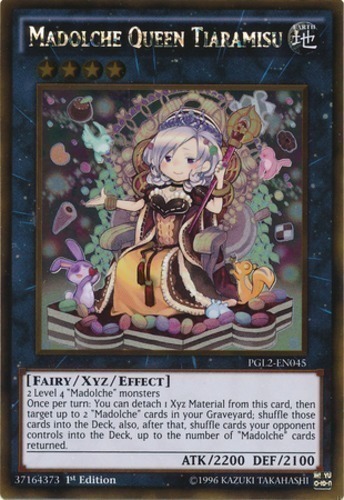 When this card is Normal Summoned: You can Special Summon 1 "Madolche" monster from your hand. When a monster effect is activated, if you have no monsters in your Graveyard: Negate the activation, then if you control "Madolche Puddingcess", shuffle 1 random card from your opponent's hand into the Deck. If this card in your possession is destroyed by an opponent's card and sent to your GY: Shuffle this card into the Deck. You can only use each of the following effects of "Madolche Petingcessoeur" once per turn. ● If this card is Special Summoned: You can Special Summon 1 "Madolche" monster from your hand or Deck, except "Madolche Petingcessoeur", and if you do, reduce its Level by 1, also you cannot Special Summon monsters for the rest of this turn, except "Madolche" monsters. If this card in your possession is destroyed by your opponent's card (by battle or card effect) and sent to your Graveyard: Shuffle this card into the Deck. While you have no monsters in your Graveyard, this card gains 800 ATK and DEF. After damage calculation, when this card battles an opponent's monster: You can target 1 card your opponent controls; destroy that target. When a Spell/Trap Card is activated, if you have no monsters in your Graveyard: Negate the activation, and if you do, return it to the hand, then, if you control a face-up "Madolche Puddingcess", you can destroy 1 card your opponent controls. When a "Madolche" card(s) is returned from your side of the field or Graveyard to your hand or Main Deck by a card effect: Add 1 "Madolche" monster from your Deck to your hand. If you control a face-up Fairy-Type "Madolche" monster, you can Special Summon the monster from your Deck in face-up Attack Position instead of adding it to your hand. You can only use the effect of "Madolche Ticket" once per turn. Each time a "Madolche" monster you control attacks or is attacked, after damage calculation: Inflict 300 damage to your opponent.